Robert George Watkins was born about 1849 in Wales, the son of William and Emma Watkins. In 1885 he married Selina (d.1923), the daughter of William and Rebecca Brown, at Sydney. They had four sons and five daughters. He died on 10 November 1920 at Chatswood. Robert George Watkins arrived in Melbourne as a child and later moved to Sydney. He became manager of Briscoe, Drysdale & Co, and later a partner with Roberts, Chalmers & Co. From 1895 he was head of R G Watkins & Co, iron, machinery and hardware merchants, and importers of contracting plant at 107 Kent Street. His private residence was Carisbrooke at 18 Botany Street, Waverley. He was a strong supporter of Bondi Surf Club and president of Waverley Cricket Club. Watkins Street in Waverley is named after him. Prior to being elected to Sydney City Council, Watkins was the Alderman of Waverley Council for three years. He was re-elected in 1905 and served as Mayor for six terms. 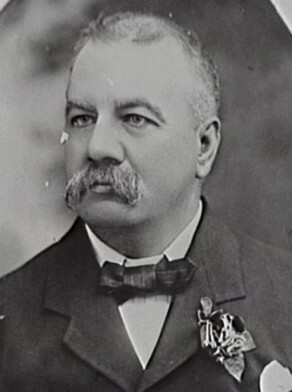 Watkins was elected Alderman for Gipps Ward of Sydney Council from 1 December 1898 to 30 November 1904. He was a member of the Electric Lighting Committee, the Works Committee, and the Finance Committee, 1899-1904. He was a member of the Health Committee, 1901-02, the Labour Advisory Committee in 1901, the Staff and Labour Committee, 1902-03 and the Health and Recreations Committee in 1903. He was the City member on the Board of Water Supply and Sewerage, 1902-05.